Send Classy Chocolate Box to Chennai. Gifts to Chennai. Send Chocolates to Chennai. Description : Pamper the tastebuds of your loved ones in Chennai with this Classy Chocolate Box that consists of 20 pieces of delectable handmade chocolates from the house of Krazy for Chocolates. These chocolates come in four amazing flavors and consist of four different toppings. 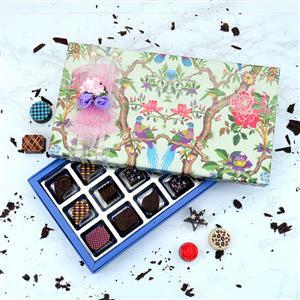 With the help of the branded online gifting portal Gift2Chennai.com, you can easily send this box of handmade chocolates as Gifts to Chennai for your loved ones, all across India.